Rupert Pupkin Speaks: Warner Archive Grab Bag - LOVESICK ""
Is the name Marhsall Brickman familiar to you? Woody Allen fans should recognize him as the co-writer of both MANHATTAN and ANNIE HALL (he also co-wrote SLEEPER, which I forgot until now). That's not a bad pedigree eh? Brickman has also directed a few times in his day. He did the uniquely odd and interesting movie SIMON with Alan Arkin. There aren't many like that one, check it out sometime. After SIMON he did LOVESICK and after that, THE MANHATTAN PROJECT (a film that I've always liked a lot). 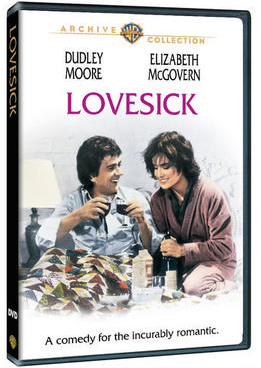 I hadn't seen LOVESICK prior to this, somehow it fell into a Dudley Moore blindspot for me. While I am mostly a fan of Moore, he sometimes annoys me a bit so there are bits and pieces of his filmography that I have yet to bother with. I think it was BEST DEFENSE and UNFAITHFULLY YOURS that finally undid the good will that I got from BEDAZZLED (which remains my favorite Dudley Moore movie). But being as I am intrigued by Marshall Brickman as a writer, I was immediately curious about LOVESICK when I realized it was one of the films he directed as well as wrote. In this particular story, Dudley Moore plays a psychiatrist who falls in love with one of his patients and doesn't know what to do about it. Pretty straightforward conflict right? Though it feels familiar, I immediately noticed some similarities to the Woody Allen world whilst watching this. The milieu of New York City and the intellectual characters who inhabit it, seem very much akin to the universe that Woody Allen and Marshall Brickman created for both ANNIE HALL and MANHATTAN. And, like ANNIE HALL, LOVESICK has a similar device wherein Dudley Moore's character has "fantastic moments" and speaks to Sigmund Freud himself (play wonderfully by Alec Guinness). Much like PLAY IT AGAIN SAM, Dudley Moore's character gets advice from Freud on how to handle things (specifically with the patient he's fallen in love with). I've always liked this brand of "magical realism" in movies. It elevates them above the standard romantic film fare that they are playing at being. The cast of the movie is quite excellent and includes the likes of John Huston, Wallace Shawn, Alan King, Ron Silver, Richard B. Shull and of course Elizabeth McGovern (as Moore's romantic interest). So with an ensemble like this, it's hard not to be engaged and entertained. I especially liked the way that the various ensemble players were sort of peppered throughout the film. Each time one of them would pop up in a scene, it always put a smile on my face. I find it interesting that Dudley Moore was in two films of this sort in 1983, LOVESICK and the blandly titled ROMANTIC COMEDY. This is certainly the better of the two and a very solid romcom from the early 1980s that has been overlooked. It was previously released in a 4x3 edition (and snapper case) but has been put out again by Warner Archive in, now in widescreen. LOVESICK can be purchased via Warner Archive. I read about this one sometime last year, never having heard of it, but recognizing Brickman's name from his Woody Allen collaborations. I had to rent it from iTunes since it was still only P&S on DVD. Super cool that Warner Archive is releasing all these titles 16:9! sorry. not a good movie at all.